First published in 1999, A Little Death presents the reader with a triple murder on page two, and then leaves no room for speculation: we are told quite firmly at the outset that one of the three must have shot the others and then committed suicide. It is a testament to Laura Wilson’s storytelling skills that she not only keeps our interest, but winds up the intrigue so that this book is hard to put down. The narrative unfolds through the alternating perspectives of the main protagonists Georgina, Edmund, and the admirable Ada, each voice possessing its own distinct and distinctive qualities. A childhood death is responsible for their ruined lives and doomed prospects, and what unfolds is a tale of sacrifice and selfishness, isolation and missed opportunities. Written in a deceptively sedate style it nevertheless had me galloping through the pages to see what the characters would get up to in the next chapter. 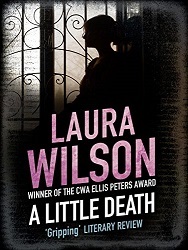 A Little Death provides a strong sense of time and place which has become a trademark for Wilson’s later works. Understated, witty, and sharply observed, it builds layer on layer, to a seductive and spell-binding mystery. Splinter In The Blood is available in most formats now (paperback is due out in May 2019) Links to buy online in the US and UK are just a click away!